Hyundai is spreading its wings. Just as Toyota has Lexus and Nissan has Infiniti, the Korean brand now has Genesis. But, wait, there’s more. Just as it’s joining the Japanese in creating a luxury division, it’s also following the Germans’ footsteps by creating a standalone performance division. Mercedes-AMG, BMW M... and now Hyundai N.
The first N product will be a turbo hot hatch, due later this year, based on the new-generation i30. However with its Genesis, Hyundai has the opportunity to a offer big, powerful rear-driver that are becoming all too rare these days, particularly with the next E63 (Benz) and M5 (BMW) switching to all-wheel drive. While Hyundai still hasn’t decided if it will cross-pollinate its luxury and performance arms, we hear it’s likely the new G70 will receive the N treatment. 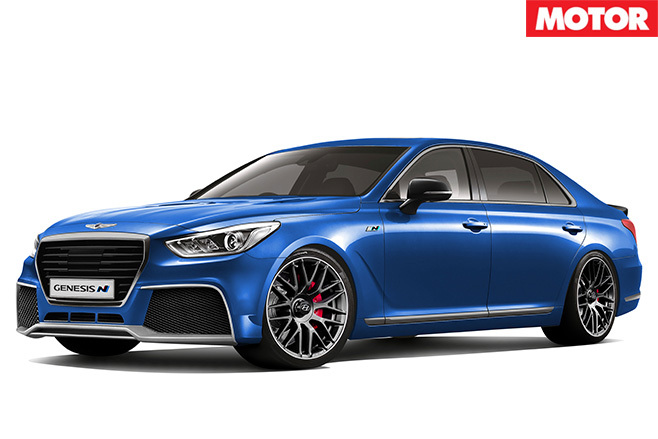 Until then, we’ve decided to wave the go-fast wand over Hyundai’s current local luxury offering, the Genesis. With big power, locally-tuned dynamics and a sharp price tag, a Hyundai Genesis N could plug the hole left by the likes of HSV. As much as we’d love to slide Hyundai’s 313kW/519Nm 5.0-litre V8 between the front strut towers, that engine doesn’t suit right-hand drive so the smart money would be on Hyundai’s latest 3.3-litre twin-turbo V6. Currently, the boosted six produces 270kW/510Nm, but we’re assured that there is plenty of upward scope from that, so we’d wind it up to a BMW M4 Competition-matching 331kW/550Nm, backed by an eight-speed automatic. Despite electronically-controlled limited-slip differentials being all the rage, we’d spend the development budget elsewhere and opt for a conventional mechanical unit. How about 20 x 9.0 fronts and 20 x 10 rears, wrapped in 275/30 and 295/30 Michelin Pilot Sport 4s? With so much rubber under it, the Genesis N would focus more on grip and precision than tyre-smoking drifts, though it’d still play that game on the racetrack. Like many successful sporting sedans, the exterior is a lesson in restrained aggression. The rear carbon lip spoiler is balanced by the front apron, while the front bumper has much larger intakes to handle the cooling requirements of the turbocharged engine. Colour palette much brighter than Hyundai’s traditional offerings. Pricing would be key to positioning the Genesis N correctly. It offers a very similar package to the new Lexus GS F, so comparing current Genesis pricing to the GS range, we’d expect a figure of around $110,000 for Hyundai’s new performance flagship.